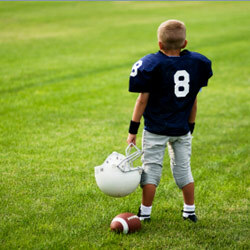 Children and sports: when it is abuse? Dr. François Fassier, head of the Division of Pediatric Orthopedic Surgery at the Montreal Children’s Hospital of the MUHC, says there is a fine line between your children just having fun with sports and your children being pushed into sports. Dr. Fassier thinks that when it comes to kids and sports, pleasure should outweigh competition. Due to the anatomy and physiology of a child’s growing body, fractures, sprains and contusions (damage to tissue under the skin) can easily occur. If a child is pushed into training too often, too long, too hard in a too specialized area at a very young age, long-term injuries can also develop. Other factors that contribute to long-term injuries include training errors, an unbalanced ratio of muscle and skeleton length and unknown birth defects. Often a chronic injury reveals itself through pain, a physical exam and/or delay in growth and puberty. It has been said that achievement of a dream is often through another person when it comes to children and sports. You could call it the pushy parents—or even coach--syndrome. In this case there is a fine line between juvenile sports and child abuse. But when is training too much? Dr. Fassier says the risk of injury in a child is higher after a period of rapid growth, beyond 8 to 10 hours of sports per week and when it dominates the child’s life. At the end of the day Dr. Fassier says fame is often short lived for the price the child has to pay physically. Moderation is the best choice. The goals of youthful sport should include pleasure, educational and social participation and healthy development. “Sports should be looked at as helping young people to become adults so they can integrate in society and be able to surpass their limits,” says Dr. Fassier. For proper development he suggests at least 30 to 60 minutes a day or 3.5 hours a week. At 10 hours a week you are entering the “risk zone”.